Ampato (possibly from Quechua hamp'atu or from Aymara jamp'atu, both meaning "frog") is a dormant 6,288-metre (20,630 ft) stratovolcano in the Andes of southern Peru. It lies about 70–75 kilometres (43–47 mi) northwest of Arequipa and is part of a north-south chain that includes the volcanoes Hualca Hualca and Sabancaya, the last of which has been active in historical time. Ampato consists of three volcanic cones, which lie on top of an older eroded volcanic edifice. They were formed sequentially by extrusion of lava flows, but Ampato has also had explosive eruptions which have deposited ash, lapilli and pumice in the surrounding landscape. 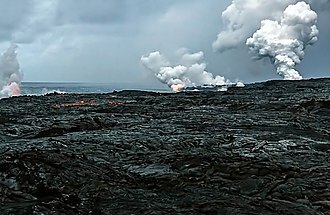 One young lava flow has been dated to 17,000 ± 6,000 years before present, but a summit lava dome is even younger, and Holocene ash layers in surrounding peat bogs may testify to the occurrence of recent eruptions. The present-day volcano is covered by an ice cap, and during the last glacial maximum glaciers advanced to low altitudes. In 1995, an Inca mummy known as Mummy Juanita was discovered on Ampato by Johan Reinhard; it had been offered as a human sacrifice more than six hundred years earlier on the mountain. Ampato lies south of the Colca Canyon and at the southern end of a chain of volcanoes formed by Hualca Hualca and Sabancaya, the last of which has been historically active. Clockwise from northeast the towns of Colihuiri, Cajamarcana, Sallalli, Japo, Baylillas, Corinta and Collpa surround the volcano; the city of Arequipa lies 70–75 kilometres (43–47 mi) to the southeast. Ampato is part of the Central Volcanic Zone of the Andes, which in Peru manifests itself as several dozen Pleistocene volcanoes, some of which erupted in historical time including El Misti, Huaynaputina, Sabancaya and Ubinas. The largest historical eruption of the Andes took place at Huaynaputina. Other volcanoes in the Peruvian Central Volcanic Zone are Sara Sara, Solimana, Coropuna, Chachani, Ticsani, Tutupaca, Yucamane and Casiri. The volcano Ampato consists of three individual steep-sided cones which rise from a gentle glacially eroded foot. These three cones are lined up in southwest-northeast direction and the highest one reaches an elevation of 6,280 metres (20,600 ft) or 6,288 metres (20,630 ft). Ampato is one of the highest volcanoes in the Central Volcanic Zone and the 35th highest summit in the Andes. The summit of the volcano is covered with an ice cap, and the edifice is incised by glacial valleys. The volcano is surrounded by three sets of moraines, the lowermost one at 4,250–4,450 metres (13,940–14,600 ft) elevation has been attributed to the last glacial maximum between 25,000-17,000 years ago, the middle one between 4,400–4,650 metres (14,440–15,260 ft) to a late readvance at the Pleistocene-Holocene epoch boundary and the higher ones above 4,800 metres (15,700 ft) to Holocene advances. Off the western coast of South America, the Nazca Plate subducts beneath the South America Plate at a rate of 5–6 centimetres per year (2.0–2.4 in/year). This subduction process is responsible for volcanism in the Central Volcanic Zone and started during the Jurassic period after the opening of the southern Atlantic Ocean, which triggered the onset of subduction of the Nazca Plate. Volcanic arc-associated volcanism originally occurred within the Cordillera de la Costa in the Jurassic, but later it migrated resulting in the emplacement of the Tacaza and Toquepala groups and finally the Neogene Barroso group. The present-day volcanic arc is situated in the area of the Barroso group but has a narrower extent. The basement beneath Ampato is formed by sedimentary and volcanic rocks of the Western Cordillera of Peru, and the rocks are of Mesozoic to Cenozoic age. A high plateau formed by ignimbrites and lavas of Pliocene to Miocene age rises above this basement. The terrain is cut by several different fault systems; one of these, the northeastward striking Sepina fault has been seismically active in the 20nd and 21st centuries and seems to have controlled the development of the Ampato and Sabancaya volcanoes. Ampato has erupted different volcanic rocks at different stages, with the earliest ones generating andesite and dacite and which define a potassium-rich suite. The rocks contain amphibole, biotite, iron oxide, olivine, plagioclase, pyroxene and titanium oxide. Processes such as fractional crystallization, magma mixing and the absorption of crustal material by developing magmas have been invoked to explain the formation of the magmas of both Ampato and Sabancaya. Estimating the rate of magma production at Ampato is difficult owing to the uncertainties in determining the volume of the edifice and the duration of repose times between eruptions; on average it appears to be 0.08–0.09 cubic kilometres per millennium (0.019–0.022 cu mi/ka). This rate does not consider "spurt"-like behaviour; volcano growth in fits and spurts has been observed at many other volcanic arc volcanoes. The Western Cordillera features various climate zones, such as the quechua and suni zones. The vegetation that occurs at high altitudes is dominated by pioneer plants, with wetlands constituting additional centres of biodiversity. A 200–600-metre (660–1,970 ft) thick pile of andesitic lava flows with additional scoria and which crops out on the southern, southeastern and southwestern side of the Ampato volcano is the oldest volcanic stage of this volcano, with argon-argon dating yielding ages between 400,000 - 450,000 years before present. Above this formation, another pile of dacitic lava flows constructed the first Ampato edifice, which was about the same size as the present-day volcano. This pile ("Moldepampa stage") is about 200–300 metres (660–980 ft) thick in outcrops and was emplaced between 230,000 - 200,000 years before present. After a pause in volcanic activity and an intermediary stage ("Yanajaja stage"; one date obtained on this stage is 77,000 ± 4,000 years before present) that produced andesitic-dacitic lava flows which form a 200–300-metre (660–980 ft) thick unit on top of eroded remnants of the older Ampato volcanics, the andesitic northern cone formed as the first of the three present-day cones. The southern cone developed in several different stages; a first stage generated lava flows emanating from the summit; dating of two such flows has produced ages of 34,000 ± 8,000 and 40,000 ± 3,000 years before present. More than 20 metres (66 ft) of block-and-ash flows was erupted onto the eastern and western flanks of Ampato, and these flows consist of one andesitic and one dacitic formation; both appear to relate to a lava dome forming stage of volcanic activity. These block-and-ash flows are themselves covered on both the eastern and the western flanks by more thick lava flows, which make up a 150–200 metres (490–660 ft) thick unit and again consist of one andesitic and one dacitic unit; both units appear to have been erupted during the last glacial maximum. Either during or before the last glacial maximum, Ampato erupted tephra during multiple explosive eruptions which today is preserved in two units, the Baylillas and the Corinta deposits. The first consists of lapilli, pumice and scoria and individual layers form thick sequences at large distances from the volcano, but are heavily eroded and thus difficult to measure in extent. Scoria flows identified on the southwestern-southern flanks of Ampato correspond to this unit. The dacitic Corinta deposits conversely were created during one large eruption which also left a crater on Ampato; it generated stratified 3–4-metre (9.8–13.1 ft) thick tephra deposits which contain pumice embedded within ash-rich layers, and it is probably also the source of the pumice flow deposits on the south-southwestern flank. These contain dacitic pumice fragments in a matrix rich in ash and have thicknesses of more than 10 metres (33 ft) in the few outcrops; much of this unit was likely eroded away by glacial activity. The central cone grew in the gap between the northern and southern edifice and consists of lava flows again of andesitic to dacitic composition. These flows are together maximally 400–600 metres (1,300–2,000 ft) thick and one flow has been dated to 17,000 ± 6,000 years before present. A dacitic summit lava dome is not affected by glacial erosion and appears to be the youngest eruption product of Ampato. Early Holocene (11,000 - 8,000 years before present) ash layers in peat bogs around the volcano may have originated either on Ampato or on Sabancaya. Late Holocene tephra layers dated to 1,790 ± 110, 2,050 ± 70 and 4,500 ± 125 likewise may have been erupted from Ampato, but Sabancaya is a more likely source for these ash layers. Presently, Ampato is considered to be a dormant volcano. Potential hazards from future eruptions at Ampato are lahars induced by melting of the icecap and sub-Plinian eruptions, considering the history of explosive eruptions at this volcano. The Peruvian geological service has published a hazard map that describes danger areas of both Ampato and Sabancaya. Hazards mapped include both the fall of ash and the formation of lahars which can advance to distances of 20 kilometres (12 mi) in the southerly valleys of Ampato. Pyroclastic fallout primarily threatens the vicinity of the volcano but large eruptions can result in fallout over large areas around the volcanic complex. Ampato was the site of human sacrifice during Inca times, when about 1466 the Mummy Juanita was offered for sacrifice on the mountain, along with two other girls and a boy. 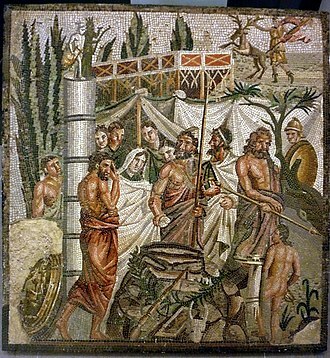 The sacrifice took place on a platform on the summit of the volcano and was presumably intended to calm the mountain spirits during an eruption of the neighbouring volcano Sabancaya. The mummies were discovered in 1995 by Johan Reinhard and colleagues on the summit of the mountain. Such sacrifices with children being the usual subjects are known as capacocha and the discoveries of their mummies on mountains in the Andes has gained them a lot of attention. The process served to tie the Inka empire more closely together, since children to be sacrificed were selected from the entire realm and the children adorned and their names remembered after the sacrifice. ^ a b c d Samaniego et al. 2016, p. 111. ^ a b c d Samaniego et al. 2016, p. 112. ^ Samaniego et al. 2016, p. 110,112. ^ a b c Samaniego et al. 2016, p. 110. ^ Alcalá-Reygosa, Palacios & Zamorano Orozco 2016, p. 1161. ^ a b c Alcalá-Reygosa, Palacios & Zamorano Orozco 2016, p. 1160. ^ Gałaś, Panajew & Cuber 2015, p. 64. ^ Juvigné et al. 2008, p. 160. ^ Samaniego et al. 2016, p. 113. ^ Gałaś, Panajew & Cuber 2015, p. 63. ^ a b c d Samaniego et al. 2016, p. 114. ^ Samaniego et al. 2016, p. 120. ^ Samaniego et al. 2016, p. 121. ^ a b c Samaniego et al. 2016, p. 126. ^ Gałaś, Panajew & Cuber 2015, p. 66. ^ Samaniego et al. 2016, p. 113,114. ^ Samaniego et al. 2016, p. 127. ^ Samaniego et al. 2016, p. 115. ^ Samaniego et al. 2016, p. 116. ^ a b c Samaniego et al. 2016, p. 117. ^ a b Samaniego et al. 2016, p. 118. ^ Samaniego et al. 2016, p. 117,118. ^ Juvigné et al. 2008, p. 171. ^ Alcalá-Reygosa, Palacios & Zamorano Orozco 2016, p. 1162. ^ "Mapa de peligros del volcán Sabancaya" (in Spanish). INGEMMET. Retrieved 26 January 2018. ^ Chávez, Chávez; Antonio, José (2001). "Investigaciones arqueológicas de alta montaña en el sur del Perú". Chungará (Arica) (in Spanish). 33 (2): 283–288. doi:10.4067/S0717-73562001000200014. ISSN 0717-7356. ^ Andrushko et al. 2011, p. 324. ^ Andrushko et al. 2011, p. 323. Alcalá-Reygosa, Jesús; Palacios, David; Zamorano Orozco, José Juan (16 February 2016). "Geomorphology of the Ampato volcanic complex (Southern Peru)". Journal of Maps. 12 (5): 1160–1169. doi:10.1080/17445647.2016.1142479. Andrushko, Valerie A.; Buzon, Michele R.; Gibaja, Arminda M.; McEwan, Gordon F.; Simonetti, Antonio; Creaser, Robert A. (February 2011). "Investigating a child sacrifice event from the Inca heartland". Journal of Archaeological Science. 38 (2): 323–333. doi:10.1016/j.jas.2010.09.009. ISSN 0305-4403. Gałaś, Andrzej; Panajew, Paweł; Cuber, Piotr (30 November 2015). "Stratovolcanoes in the Western Cordillera – Polish Scientific Expedition to Peru 2003–2012 reconnaissance research". Geotourism/Geoturystyka. 0 (37): 61–68. ISSN 2353-3641. Juvigné, Etienne; Thouret, Jean-Claude; Loutsch, Isabelle; Lamadon, Sébastien; Frechen, Manfred; Fontugne, Michel; Rivera, Marco; Dávila, Jasmine; Mariño, Jersy (1 June 2008). "Retombées volcaniques dans des tourbières et lacs autour du massif des Nevados Ampato et Sabancaya (Pérou méridional, Andes Centrales)". Quaternaire. 19 (2): 157–173. doi:10.4000/quaternaire.3362. Samaniego, Pablo; Rivera, Marco; Mariño, Jersy; Guillou, Hervé; Liorzou, Céline; Zerathe, Swann; Delgado, Rosmery; Valderrama, Patricio; Scao, Vincent (September 2016). "The eruptive chronology of the Ampato–Sabancaya volcanic complex (Southern Peru)". Journal of Volcanology and Geothermal Research. 323: 110–128. doi:10.1016/j.jvolgeores.2016.04.038. ISSN 0377-0273. Reinhard, Johan The Ice Maiden: Inca Mummies, Mountain Gods, and Sacred Sites in the Andes. 2005, Washington, D.C.: National Geographic Society. "Sabancaya". Global Volcanism Program. Smithsonian Institution. Biggar, John (2005). The Andes: A Guide for Climbers (3rd ed.). Andes Publishing (Scotland). p. 304 pp. ISBN 978-0-9536087-2-0. De Silva, Shanaka L.; Francis, Peter (1991). Volcanoes of the Central Andes. Springer-Verlag. p. 216 pp. ISBN 978-3-540-53706-9. 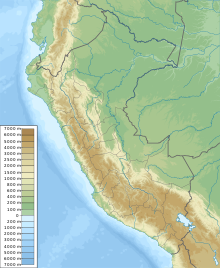 The Andean Volcanic Belt is a major volcanic belt along the Andean cordillera in Argentina, Chile, Colombia and Peru. It formed as a result of subduction of the Nazca Plate, the belt is subdivided into four main volcanic zones that are separated from each other by volcanic gaps. The volcanoes of the belt are diverse in terms of activity style, while some differences can be explained by which volcanic zone a volcano belongs to, there are significant differences within volcanic zones and even between neighboring volcanoes. Romeral in Colombia is the northernmost member of the Andean Volcanic Belt, South of latitude 49° S within the Austral Volcanic Zone volcanic activity decreases with the southernmost volcano Fueguino in Tierra del Fuego archipelago. The Andean Volcanic Belt is segmented into four areas of active volcanism. The Northern Volcanic Zone extends from Colombia to Ecuador and includes all volcanoes on the mainland of these countries. Of the zones volcanoes,55 are located in Ecuador while 19 are in Colombia, in Ecuador the volcanoes are located in the Cordillera Occidental and Cordillera Real while in Colombia they are located in Cordillera Central. The volcanic arc has formed due to subduction of the Nazca Plate under western South America, some volcanoes of the Northern Volcanic Zone, such as Galeras and Nevado del Ruiz that lie in densely populated highland areas, are major sources of hazards. It has been estimated that crustal thickness beneath this region varies from around 40 to perhaps more than 55 km, sangay is the southernmost volcano of the Northern Volcanic Zone. The Central Volcanic Zone is an arc in western South America. 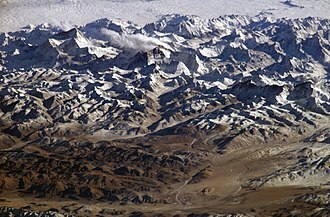 It is one of the four zones of the Andes. The Central Volcanic Zone extends from Peru to Chile and forms the boundary of the Altiplano plateau. The volcanic arc has formed due to subduction of the Nazca Plate under western South America along the Peru–Chile Trench, the CVZ is characterized by a continental crust that reaches a thickness of approximately 70 km. Within this zone there are 44 major and 18 minor volcanic centers that are considered to be active, other silicic systems are Los Frailes ignimbrite plateau in Bolivia, and the caldera complexes of Incapillo and Cerro Galán in Argentina. Arequipa is the capital and largest city of the Arequipa Region and the seat of the Constitutional Court of Peru. Its industrial activity includes manufactured goods and camelid wool products for export, the city has close trade ties with Chile and Brazil. The city was founded on August 15,1540, by Garcí Manuel de Carbajal as Villa Hermosa de Nuestra Señora de la Asunción, during the Colonial period, Arequipa became highly important for its economic prosperity and for its loyalty to the Spanish Crown. After Peru gained its independence from Spain in 1821, Arequipa acquired greater political significance, the historic center of Arequipa spans an area of 332 hectares and is a UNESCO World Heritage Site. 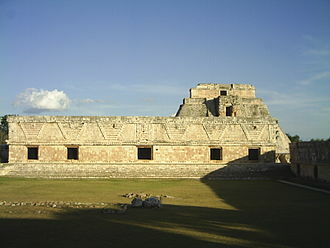 Its historic heritage, natural scenery and cultural sites make the city a major tourist destination and its religious and republican architectural styles blend European and native characteristics into a unique style called Escuela Arequipeña. 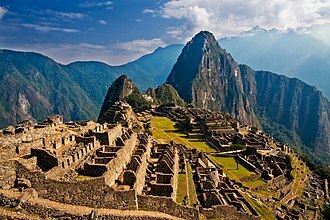 A local tradition states that Inca Mayta Capac received a petition from his subjects to reach the valley of the River Chili and they asked him for permission to stay in the region as they were impressed by the beauty of the landscape and the mild climate. 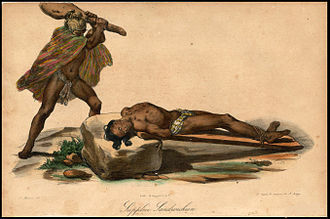 However, another tale states that when the first Europeans arrived to the valley, they pointed at the ground. The local chief, not understanding the question, assumed they were asking for a permission to sit down and gave a positive answer, which sounded like Arequipa. 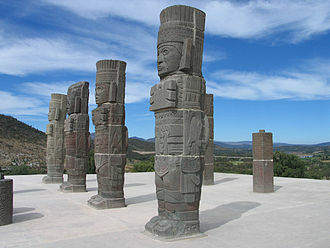 Another possible origin of the name comes from the Aymara language phrase qhipaya ari or Ari qipa. The early inhabitants of the Arequipa City area were people who relied on activities such as hunting and gathering for survival. Later, pre-Inca cultures domesticated llamas and became sedentary with the development of agriculture, during this time, major irrigation channels were built within the valley of the Chili river, which allowed the development of agriculture by means of terraces built on both sides of the valley. 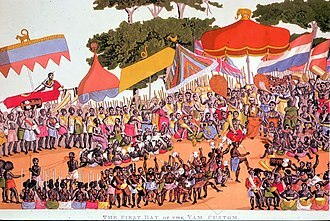 The Yarabaya and Chimbe tribes settled in the current location. Lands were distributed among three families who founded the towns of Yanahuara, Tiabaya, Socabaya and others. At the time of its foundation, Arequipa had already a city council, because the foundation of the town occurred in part as a relocation of Villa Hermosa de Camana, the name was partially conserved as Villa Hermosa de Arequipa. Lapilli is a size classification term for tephra, which is material that falls out of the air during a volcanic eruption or during some meteorite impacts. Lapilli means little stones in Latin, by definition lapilli range from 2 to 64 mm in diameter. A pyroclastic particle greater than 64 mm in diameter is known as a bomb when molten. Pyroclastic material with less than 2 mm in diameter is referred to as volcanic ash. Lapilli are spheroid-, teardrop-, dumbbell- or button-shaped droplets of molten or semi-molten lava ejected from an eruption that fall to earth while still at least partially molten. These granules are not accretionary, but instead the result of liquid rock cooling as it travels through the air. Lapilli tuffs are a common form of volcanic rock typical of rhyolite and dacite pyroclastic eruptions. Most lapilli tuffs which remain in ancient terrains are formed by the accumulation, the heat of the newly deposited volcanic pile tends to cause the semi-molten material to flatten out as it they becomes welded. Tutupaca is a twin volcano in Peru, about 5,815 metres high. It is located in the Tacna Region, Candarave Province, Candarave District, Tutupaca is situated northwest of Lake Vilacota and Yucamane volcano. The northern edifice is more strongly eroded and underwent a flank collapse, the volcano has postglacial lava flows and underwent a major historical eruption between 1787 and 1802. Historic records of the latest eruption were considered to be from the neighboring Yucamane volcano before being confirmed by recent geochronology work, the volcano is active with fumaroles, one was reported on the northeastern flank in 1953. Debris avalanche deposits are mined for sulfur, major moraines of probably Late Glacial Maximum lie in the surrounding valleys and on the basal edifice. The western smaller edifice is a complex of lava flows and domes with Plinian eruptive activity, one biotite was dated to 0.7 Ma ago. The eastern edifice is formed by lava domes unaffected by glacial action, several non-pristine lava flows are discernible. Two edifice failure events are noticeable on the edifice, an older channelized towards the east-southeast. The river valleys Tacalaya and Callazas run beside the volcano complex, a major SE-NW-trending fault system is associated with the volcano and may be related to the formation of the amphitheatre. A major eruption occurred between 1787 and 1802, causing the failure of the flank of the volcano with a volume of 1 km3. The collapse caused the release of pyroclastic flows with a volume of 6. 5–7. 5×107 m3. The main collapse was preceded by a pyroclastic flow named Suri Phuju after the valley it is exposed in, the main debris avalanche formed levees and contains huge blocks and hummock hills. The debris deposit is overlain with a pyroclastic flow named Paipatja that reached the Suches lake to the north of the volcano. Ash fall was reported as far as Arica,165 km to the south of the volcano and this is probably the youngest debris avalanche in the Andes and one of the largest historical volcanic eruptions of Southern Peru. Some authorities restrict the use of the term to bodies deliberately embalmed with chemicals, but the use of the word to cover accidentally desiccated bodies goes back to at least 1615 CE. Mummies of humans and other animals have found on every continent. Over one million animal mummies have been found in Egypt, many of which are cats, in addition to the well-known mummies of ancient Egypt, deliberate mummification was a feature of several ancient cultures in areas of America and Asia with very dry climates. The Spirit Cave mummies of Fallon, Nevada in North America were accurately dated at more than 9,400 years old. Before this discovery, the oldest known deliberate mummy was a child, one of the Chinchorro mummies found in the Camarones Valley, which dates around 5050 BCE. The oldest known naturally mummified corpse is a severed head dated as 6,000 years old. 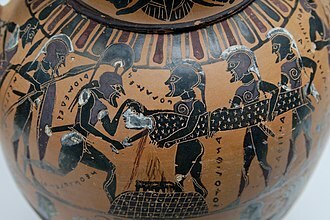 These substances were defined as mummia, the OED defines a mummy as the body of a human being or animal embalmed as a preparation for burial, citing sources from 1615 CE onward. However, Chambers Cyclopædia and the Victorian zoologist Francis Trevelyan Buckland define a mummy as follows, applied to the frozen carcase of an animal imbedded in prehistoric snow. Wasps of the genus Aleiodes are known as mummy wasps because they wrap their prey as mummies. While interest in the study of mummies dates as far back as Ptolemaic Greece, prior to this, many rediscovered mummies were sold as curiosities or for use in pseudoscientific novelties such as mummia. The first modern scientific examinations of mummies began in 1901, conducted by professors at the English-language Government School of Medicine in Cairo, Egypt. The first X-ray of a mummy came in 1903, when professors Grafton Elliot Smith, British chemist Alfred Lucas applied chemical analyses to Egyptian mummies during this same period, which returned many results about the types of substances used in embalming. Lucas made significant contributions to the analysis of Tutankhamun in 1922, pathological study of mummies saw varying levels of popularity throughout the 20th century. Sabancaya is an active 5, 976-metre stratovolcano in the Andes of southern Peru, about 100 kilometres northwest of Arequipa. Sabancaya hosts several glaciers which cover an area of about 3.5 square kilometres, the andesite stratovolcano of Sabancaya has been very active during historic times, with the earliest recorded eruptions in 1695 and 1758. The most sustained period of activity began with explosive eruptions on May 28,1990, the eruptive cycle rated a VEI of 3, with more than 25 million cubic metres of lava flows and tephra produced over that period. At the height of the activity in 1994, eruptions producing large ash clouds occurred every two hours, although published topographic maps have not been revised since the eruptive cycle, it is suspected that the cone may have grown to just over 6,000 metres during that time. Additional smaller eruptions occurred in 2000 and 2003, Sabancaya is considered one of the most hazardous volcanoes in Peru, along with the massive Coropuna and the cone of El Misti near Arequipa. Pumice, called pumicite in its powdered or dust form, is a volcanic rock that consists of highly vesicular rough textured volcanic glass, which may or may not contain crystals. Scoria is another vesicular volcanic rock that differs from pumice in having larger vesicles, thicker walls and being dark colored. Pumice is created when super-heated, highly pressurized rock is violently ejected from a volcano, the unusual foamy configuration of pumice happens because of simultaneous rapid cooling and rapid depressurization. The depressurization creates bubbles by lowering the solubility of gases that are dissolved in the lava, the simultaneous cooling and depressurization freezes the bubbles in a matrix. Eruptions under water are cooled and the large volume of pumice created can be a shipping hazard for cargo ships. Pumice is composed of highly microvesicular glass pyroclastic with very thin and it is commonly, but not exclusively of silicic or felsic to intermediate in composition, but basaltic and other compositions are known. Pumice is commonly pale in color, ranging from white, blue or grey and it forms when volcanic gases exsolving from viscous magma form bubbles that remain within the viscous magma as it cools to glass. Pumice is a product of explosive eruptions and commonly forms zones in upper parts of silicic lavas. Pumice has a porosity of 90%, and initially floats on water. Scoria differs from pumice in being denser, with larger vesicles and thicker vesicle walls, it sinks rapidly. The difference is the result of the viscosity of the magma that forms scoria. When larger amounts of gas are present, the result is a variety of pumice known as pumicite. Pumice is considered a glass because it has no crystal structure, pumice varies in density according to the thickness of the solid material between the bubbles, many samples float in water. After the explosion of Krakatoa, rafts of pumice drifted through the Pacific Ocean for up to 20 years, in fact, pumice rafts disperse and support several marine species. In 1979,1984 and 2006, underwater volcanic eruptions near Tonga created large pumice rafts, there are two main forms of vesicles. Specimen of highly porous pumice from Teide volcano on Tenerife, Canary Islands. Density of specimen approximately 0.25 g/cm3; scale in centimeters. 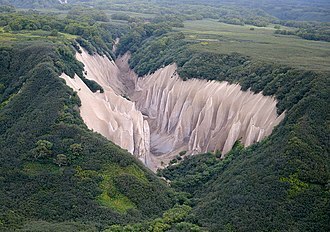 Kutkhiny Baty, a pumice rock formation outcrop located 4 km from the source of the Ozernaya River (Lake Kurile), near the southern tip of the Kamchatka Peninsula, Russia. Image of the rhyolitic lava dome of Chaitén Volcano during its 2008–2010 eruption. 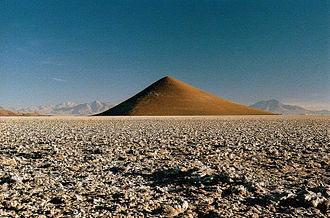 One of the Mono Craters, an example of a rhyolite dome. View of the crater and part of the nearby valley. 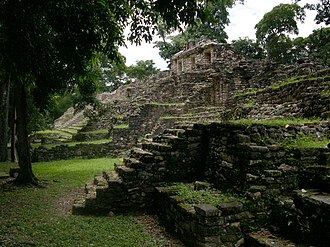 Tutupaca viewed from a southern direction. The summit of Mount Logan in the Yukon, the highest point in Canada, is ranked sixth in the world by topographic prominence.